Class DB have been writing a multimedia story based on a short silent film about a travelling tight rope walker from Spain called: El caminante. The children wrote their own narration, and dialogue to go with the film. The multimedia story was put together on powerpoint with screenshots from the film, speech bubbles, narration, music (spanish guitar piece by John Williams) and animation effects. The finished presentations were then saved as media videos - watch this one below by Kate. Year 6 have been looking at Aztec sun stones and have designed some of our own. First we used our sketch books to experiment with ideas until we reached a finished design. Our designs were transferred onto a polystyrene tile. Before printing, we created a mosaic background using colours from our original design. The year 6 children have been looking at the Aztecs (from Mexico) this term. They have made tortillas and salsa using the new kitchen facilities. They really enjoyed what they had made. Yesterday our school hockey team took part in the County tournament at St Joseph's School in Ipswich. The tournament featured 12 district champions - divided into 3 groups of 4. SRH won 4-0 vs St Felix, 2-0 vs Horringer and 2-1 vs Holbrook. Each of the 3 group winners then played each other to decide 1st, 2nd and 3rd place. Framlingham beat Whatfield and Nayland to become County Champions for the first time. Mrs Catherine Hill, one of our Parent Governors, is stepping down when her term of office ends and we would like to take this opportunity to thank her for all her hard work since she joined the Governing body in 2011. I am therefore writing to give you details of the arrangements for nominations and voting for a new Parent Governor. We have one vacancy to take office from 1st May 2015. All parents have been sent a letter with a nomination form on which four parents who have children at the school can jointly nominate another parent for election as a Parent Governor. No parent may nominate more candidates than there are vacancies. It is necessary for a parent Governor to have a child at the school at the time he or she is elected. Certain people are disqualified from being Governors and these are described on the back of the nomination form. Completed nomination forms must be returned to school by Friday 17th April 2015. Please remember your school sweatshirts on Wednesday for the class photos. Thank you. The service is being prepared and run by children from class ES and JA, so we would welcome the parents and grandparents of these pupils to St Michael’s Church this Thursday at 1.30pm. The rest of the school will go to the same service in the morning. Unfortunately Mrs Picton is unable to attend these services due to another commitment. FRIENDS CAKE STALL – THIS FRIDAY 27 MARCHRemember to bring some money in to buy a sweet Easter Treat from the Friends stall in the pavilion on the front playground on the last day of term, baked by NS & JC. The parent council has a number of Summer dresses, PE kit and other uniform items that they will be selling on the playground on the last day of term. Do come along to stock up your child’s uniform at bargain prices. Invoices for Violin, Guitar & Play-On Flute have been sent by email (or hardcopy if that’s how you received it last time) on Monday 23 March. If you have not received them by Wednesday then please contact the office. Payment is due on the first week back before Wednesday’s lessons. A group of boys from Sir Robert Hitcham’s are taking part in this performance with the Phoenix Singers at St Michael’s Church on Saturday. Tickets are available from william@glasse.org.uk or 07802 597071. This will be a very exciting experience for the boys who have been practicing hard. We have been notified by Highways that they will be installing temporary supports on the boundary wall of the property currently fenced off at the bottom of Mount Pleasant from 23 - 25 March from 7am-5pm each day. Vehicle access will be manually managed on site. Also, from 28 March (for up to 4 weeks) there will be work on Pembroke Road (drainage pipes/inspection chambers). The road will be closed to through traffic for the first 2 weeks. The surgery can still be accessed from Mount Pleasant. For the last 2 weeks vehicle access will be managed by temporary traffic lights. MFSF Wind & Brass; & all lunchtime clubs. Children return to school on Tuesday 14 April. 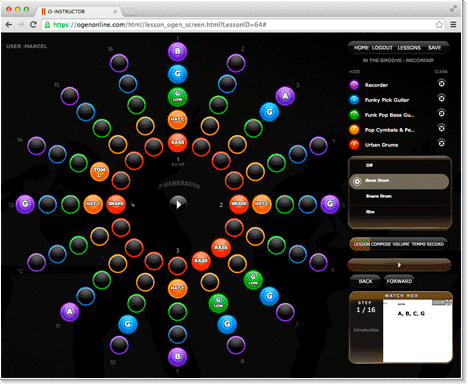 The software allows you to choose instruments, tempo and styles to compose a piece of music. The compositions can be saved as MP3 files and used in other programs. On Wednesday our school won a swimming gala for 10 local schools at Framlingham College. The gala featured individual races (heats and finals) plus relays and a raft race. The SRH team with their medals - they will take part in a County gala in the Summer. Why do Miss. Ashberry and Mrs. Mawson think these boys are fab? Ask them what they have been up to! Very well done for today boys. You did us proud! Marcel from Bassistry Music kindly came back to spend some time with our young musicians in orchestra. He helped us compose and improvise through his program Ogenerator. At first we found it quite challenging to learn by ear and improvise but soon found confidence to just go for it and trust our ears and musicality. Mrs Fell and her 27 violinists WOW us all! Those of us who were lucky enough to be able to attend the violin concert enjoyed a delightful selection of performances from Cal Fell's talented and eager pupils. They all played with conviction, confidence and wonderful musicality. An added bonus was a stunning performance by ex-pupil, Maddie Brooks. She showed us what years of hard work, dedication and practise can result in. Well done to them and thank you Cal for helping to fill the school with music! Also from 28 March (for up to 4 weeks) there will be work on Pembroke Road (drainage pipes/inspection chambers). The road will be closed to through traffic for the first 2 weeks. The surgery can still be accessed from Mount Pleasant. For the last 2 weeks vehicle access will be managed by temporary traffic lights. The 30th annual chess tournament reached the final last week and featured a girl for the first time. This week also saw the start of our first ever inter-house team tournament.